This morning, I had my first run of the season with long sleeves and capris. This afternoon for my run, I was wearing shorts and a tank top. Oh yes, it’s typical Texas weather here. As I pulled out my capri tights I bought three years ago (my first winter running outdoors), I was glad they still fit comfortably. I can be a little tight with money. I consider it an asset, but my teenage son says I’m cheap. When you have a family of six, it’s necessary to cut corners where possible. Especially when have a teenage boy, a teenage daughter with hours of marching band practice, a husband with high metabolism, and me – the [marathon] runner. I’m thankful the other two children are little because they don’t eat much yet. As a mom, it’s hard for me to spend money on myself. I have dress shoes that are three years old, and most of my everyday clothes are baggy. My hair is trying to turn silver, but I’m yanking those because I won’t spend the money to color it. Heck, I’m doing good to get three haircuts a year. Yet, I am okay with all of that. I would rather spend money on running gear and races. I’ve read a few magazine articles about how to save money running, but I’ve found a few other ways to add. Let’s start with the most obvious: race fees. You can easily save just by planning out your race schedule. Get in on the early registration and you can save anywhere from $10-$50. 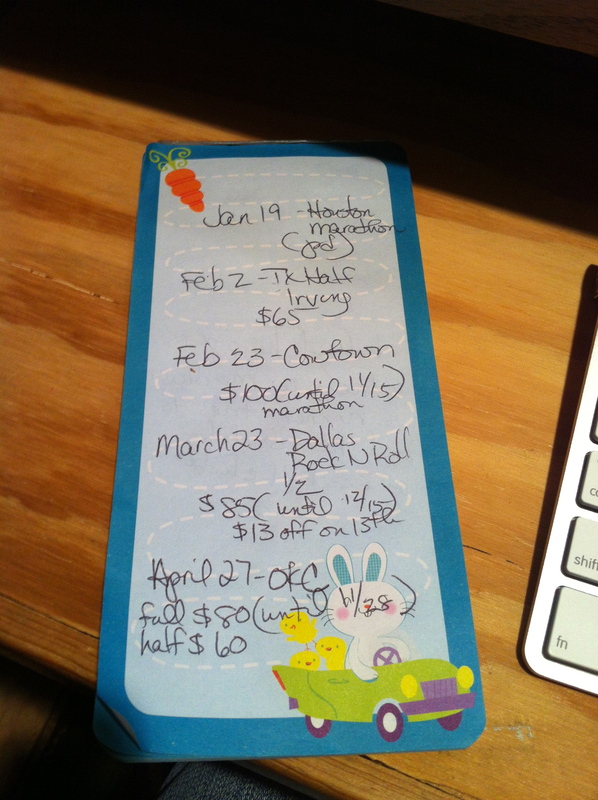 I did this last week by writing down the date of the race, registration amount, and when the fees would go up. It’s not fancy – and yes, I did use a springtime notepad in October – but it works. I can see with a quick glance that I need to register for the Cowtown Marathon by November 15 (and I’ll save $10). Technical clothing can be expensive. I’m glad to see more races use tech shirts instead of cotton, and I’ve been able to build quite a collection this way. I especially like to wear the marathon tops in other races. Of course I still have a nice balance of cotton tees to wear around town on the weekends. To save money on my shorts, I check the clearance at my local running store, Nike outlet, or shop online from Running Warehouse. I have also bought clothing at Target, JCPenney, TJMaxx and Kohl’s to try out different brands. Usually my purchases have been marked with a red tag and/or are part of a big sale. Combining coupons (I’m not too proud and Target has some great ones!) has allowed me to replace items as my size changed. By spending less, I’m not worrying about wasting a bunch of money if something doesn’t work out for me – like compression shorts. They really don’t stay in place. Do you make a race plan in advance to save on registration fees? How do you save on clothing? you can expect to be tested for a Saturday morning race. October 12th was my first half marathon since June. I put it in my marathon training plan because: a) I’ve done the race before – 2 years ago; b) It was cheap for a half marathon – $30. Whoohoo! and c) I had some friends that were going to run it as well. Since I have been training for the Dallas Marathon, I didn’t adjust my plan with a taper and reduced mileage. I wanted to test my legs when tired. I should be able to set a new PR, but my goal is the marathon right now and I need my focus there. Earlier in the week I found out my friends weren’t going to be able to go, so I psyched myself up to go solo. I did pay for it and I’m too cheap to waste registration fees. Thursday night I found out my husband was going to be out of town. When I checked the forecast on Friday, race day didn’t look so great. Since I was flying solo, Friday night I was responsible for picking up my daughter after an out of town game. 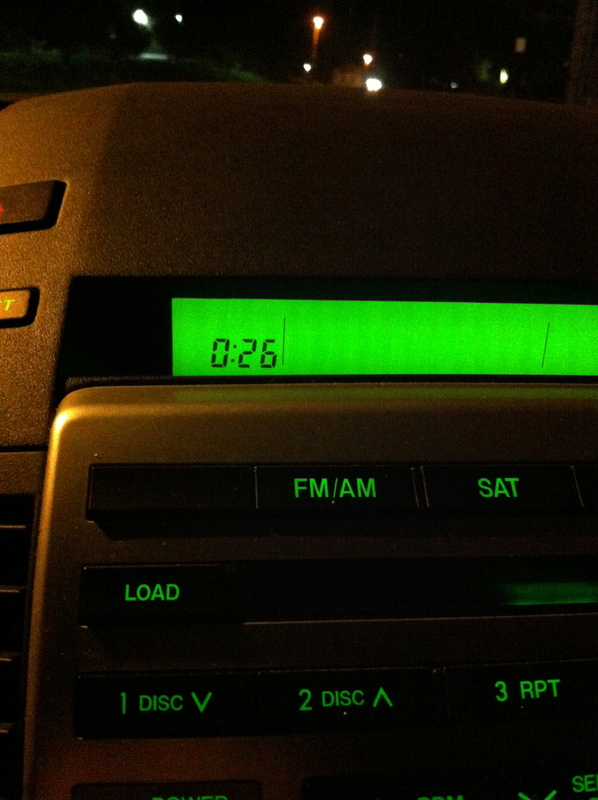 See above photo for the crazy hour I was sitting in the parking lot. When I stepped outside Saturday morning after a few hours of choppy sleep, the mugginess of the day caught my breath. Yuck. It took me almost an hour to get to the town, and then I spent another 45 minutes trying to find the start. When I finally made it to the location at 8:30, I grabbed my phone, iFitness belt, chews, and shut the door. Then I realized my keys were not in my hand, so I looked in the window and there they were – right in the ignition where I left them. I called AAA (best investment ever) and they gave me a 45 minute ETA. The race had a start time of 9:00. I fully intended to sit it out. When I went to get my packet, I ran into a few other runners I knew. I gave my chews to one who forgot her gels. “I won’t need them.” They called “two minutes to start” and I wished them luck. I immediately got a call from the contractor who was two blocks away. My friend (who wasn’t able to go) called me to say I had better run anyway. I offered excuses, but she wasn’t listening. “These are the things that make us,” she said. My car was opened about a minute later. I grabbed my keys, bottle of Nuun, my visor, and my Garmin and ran to the start. “Am I too late to start?” I asked the official looking lady by the banner. She pointed to the clock. “They left about five minutes ago.” I took off – Garmin in one hand, Nuun and visor in the other. I started my Garmin knowing that it would take it awhile to get going and noted the time on my phone when it started. 9:07. I then tried to put my visor on while carrying my Nuun. I ended velcroing a chunk of my hair doing this, but after two hours of running in 70 plus degrees, it really wouldn’t matter. I ran my first few miles too fast, but I wanted to catch up to other participants. I have a fear of wrong turns. After I caught some of the walkers, I started to relax a bit. The course was an out and back loop, then again in reverse. When I hit halfway, my time was 61:46 according to the timekeeper. Then the heat of the day set in, and after my near dehydration last year, I have learned to listen to my body. 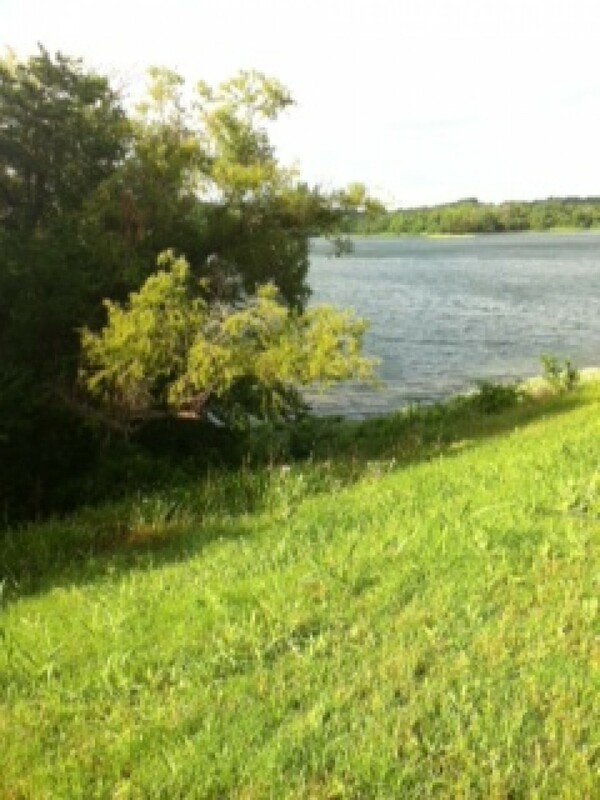 I settled into a run/ walk plan to cool off a bit. My official time at the finish was 2:07:35 which was good enough for 3rd in my age group, but more importantly I learned a lot about myself. I can overcome obstacles. I am tougher than I imagined. It’s not always about a number, but about what I can do when facing difficulties. What obstacles have you encountered as a runner?